Genie gained her title at exactly 12 months of age, with a 25 point BOB. Since then she has won Multiple BIG multiple RU in Groups and multiple classes in show. Genie has spent almost 18 months out of the ring while on maternity duties and has produced some beautiful babies.Her babies have gone on to do just as well as she has by winning some fabulous awards including best exhibit in show, multiple runner up best exhibit in show, best exhibit in group and multiple classes in show. Genie is a wonderful mother and is passing on her kind heart to her babies. 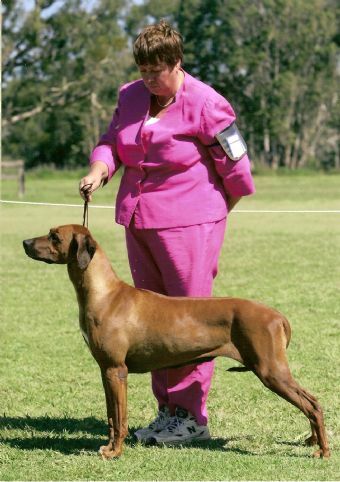 Her daughter Nkazimlo Brown by design has been winning best exhibit in show, multiple runner up best exhibit in show, multiple classes in show and Challenge points and is still in the maturation process and is not near her full potential yet. 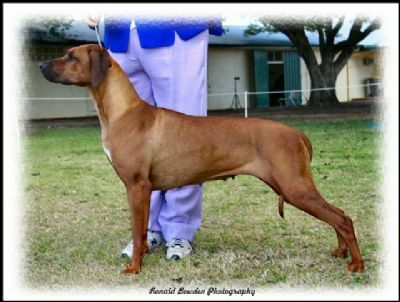 Genie is well on her way to her grand championship title. Her son aka "spike" Nkazimlo designer spirit is also had a great time in the ring with some noteable wins. He was a sweetie second to none. Sadly spike passed away very unexpectedly leaving our family devastated.